Nifty opened flat to positive and stayed in a narrow range for the better part of the day but saw some selling pressure around closing moments to end in the red at 6268.40, a small loss of 16.10 points. The broader market though was strong, with 834 advances to 547 declines. Range for expiry has come down to 6230-6330. 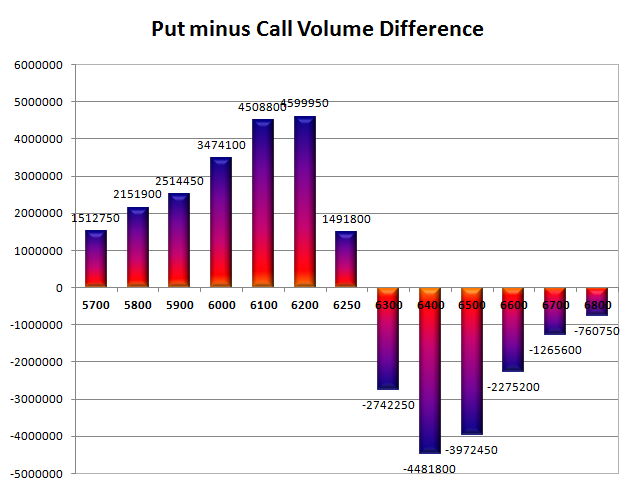 Call option 6250-6300 added 10.87 lacs huge amount of OI with short covering seen at 6200 and below strike prices. 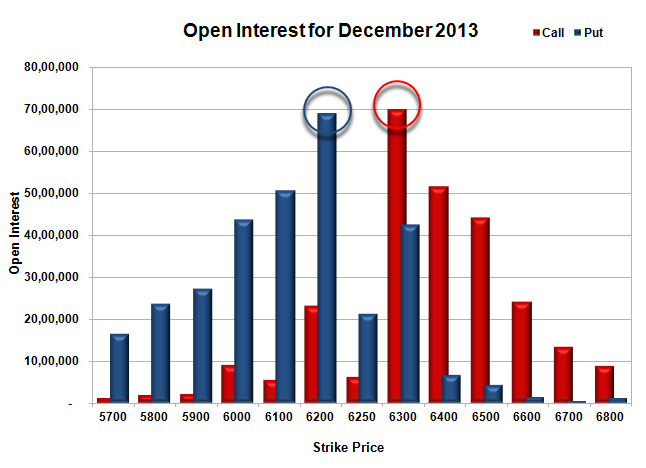 Put option 6250-6200 added 6.65 lacs huge amount of OI with short covering seen at 6300 and above strike prices. Nifty Open Interest is at 1,15,78,000 down by huge 17,95,950, whereas Jan series added 27.10 lacs OI with small decrease in price, 100% rollover with some short build-up. Bank Nifty Open Interest is at 11,07,600 down by 83,075, whereas Jan series added 1.30 lacs with decrease in price, 100% rollover with huge short build-up. FII’s bought 3.25 lacs Futures, mostly long build-up, as their net OI increased by 44363 contracts (includes 140364 longs and 133857 shorts for the day) and the average price per contract comes to around 6263.59. FII’s future open contract as on date is 665031. PCR Open Interest (Volume) moved down to 1.287. Initial and best support at 6200, with huge OI of 69.15 lacs and below that at 6100 with huge OI of 50.78 lacs. 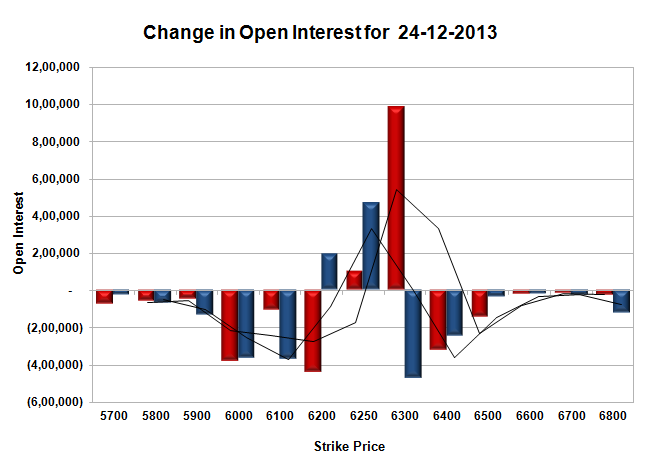 Initial and best resistance at 6300, with highest OI of 69.93 lacs and above that at 6400, with OI of 51.58 lacs. 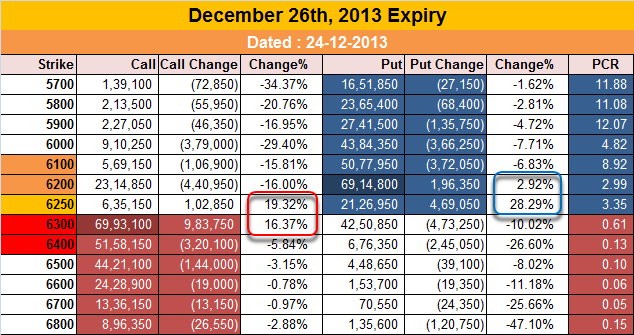 Expiry Day Range as per Option Table is 6217 - 6330 and as per VIX is 6217 - 6320 with 6277 as the Pivot.